Therianthropy means metamorphosing into another species, transforming from human to non-human animal. 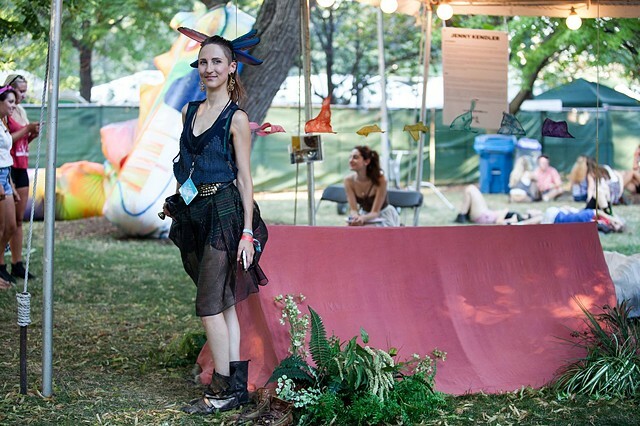 Participants are invited to enter into the hand-dyed dappled orange silk tent, lined with many species of fur—all sourced from vintage upcycled fur coats. Inside the tent it is dark with a deep reddish glow, and the fur pile of the coyote fur floor is thick and warm. 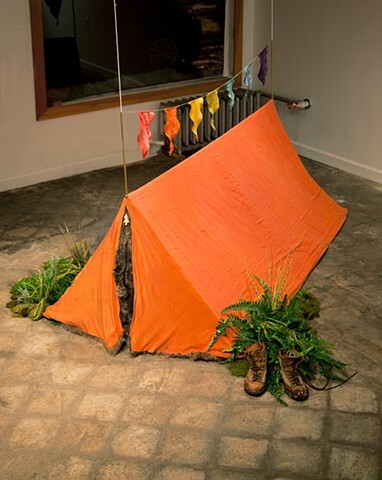 From Hyperallergic's review: "'Therianthropy' is an orange tent with rainbow-colored pennants hanging horizontally on a string above it. The rainbow colors Kendler uses suggest a two-fold meaning — rainbows are both naturally occurring reflections of light in water droplets, and man-made symbols of bliss and gaiety (sexual or not). 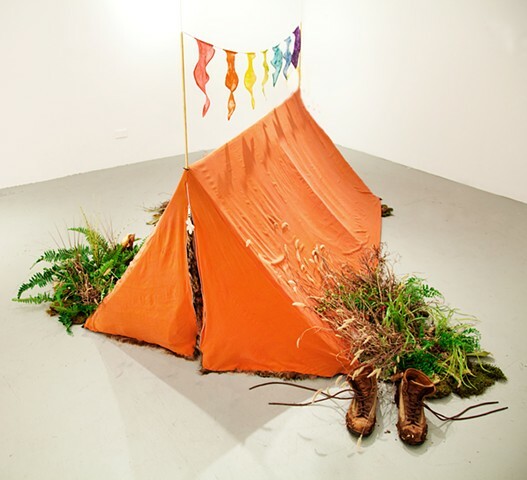 The pennants outside the tent reference the former, yet recognize man’s interest in reinterpreting and appropriating the rainbow. An array of furs line the interior of the tent; viewers are invited to partially undress and enjoy the feeling of their skin rubbing against the fur that once belonged to a warm, living, breathing animal body. “Therianthropic” means “partly bestial and partly human in form,” which is exactly the division one experiences in this piece." Therianthropy has traveled to the Pitchfork music festival (attended by over 50,000 people), and to exhibition spaces in Chicago, Detroit, North Dakota, and most recently to the MACC in Austin, TX. 55 x 60 x 84 in.